Open Access - Articles with this logo are immediately and permanently available online. Unrestricted use, distribution and reproduction in any medium is permitted, provided the article is properly cited. Background Injections of mixtures prepared from crushed tablets contain insoluble particles which can cause embolisms and other complications. Although many particles can be removed by filtration, many injecting drug users do not filter due to availability, cost or performance of filters, and also due to concerns that some of the dose will be lost. Methods Injection solutions were prepared from slow-release morphine tablets (MS Contin®) replicating methods used by injecting drug users. Contaminating particles were counted by microscopy and morphine content analysed by liquid chromatography before and after filtration. Results Unfiltered tablet extracts contained tens of millions of particles with a range in sizes from < 5 ìm to > 400 ìm. Cigarette filters removed most of the larger particles (> 50 ìm) but the smaller particles remained. Commercial syringe filters (0.45 and 0.22 ìm) produced a dramatic reduction in particles but tended to block unless used after a cigarette filter. Morphine was retained by all filters but could be recovered by following the filtration with one or two 1 ml washes. 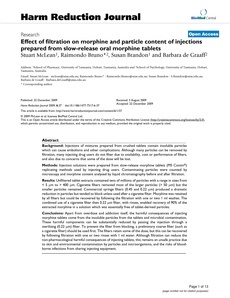 The combined use of a cigarette filter then 0.22 ìm filter, with rinses, enabled recovery of 90% of the extracted morphine in a solution which was essentially free of tablet-derived particles. Conclusions Apart from overdose and addiction itself, the harmful consequences of injecting morphine tablets come from the insoluble particles from the tablets and microbial contamination. These harmful components can be substantially reduced by passing the injection through a sterilizing (0.22 ìm) filter. To prevent the filter from blocking, a preliminary coarse filter (such as a cigarette filter) should be used first. The filters retain some of the dose, but this can be recovered by following filtration with one or two rinses with 1 ml water. Although filtration can reduce the non-pharmacological harmful consequences of injecting tablets, this remains an unsafe practice due to skin and environmental contamination by particles and microorganisms, and the risks of blood-borne infections from sharing injecting equipment.